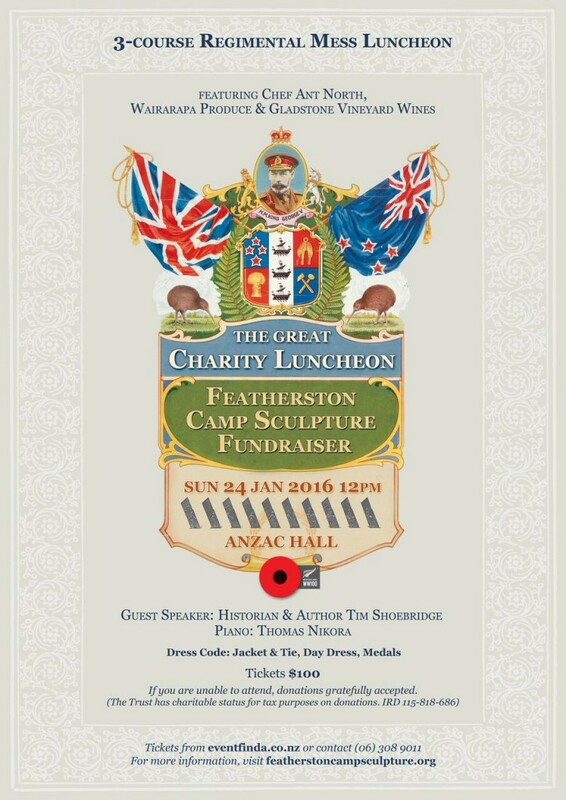 The Great Charity Luncheon takes place in Featherston’s historic Anzac Hall to support the plan for a sculpture commemorating Featherston Military Training Camp in World War One, and its connection with Featherston township. This will be a three-course regimental mess-style lunch by chef Ant North, lubricated by Gladstone Vineyard wines and organised by the Featherston Camp Memorial Trust. Guest speaker is historian Tim Shoebridge from the Ministry for Culture and Heritage, who has researched Featherston Camp for some years. Music is provided by Thomas Nikora. This is a formal occasion, taking place exactly 100 years after the occupation of the new Featherston Camp.